The DIY Income Investor approach is generally 'buy and hold'. However, there are times when it is OK to sell (and there are times when you need to sell). 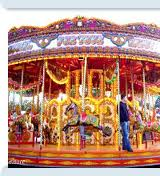 My mental image of the stock market is similar to one of those fairground carousels with ornately carved horses riding up-and-down as well as round-and-round; each horse follows a cycle of being high then falling, being low then rising. My strategy is to ride the horse to the top and then shift to one that is beginning to rise. What goes around comes around. Pretty simplistic eh! So what encouraged me to sell this time? Shares that pay good dividends do not usually fluctuate wildly in price. This lack of volatility is generally a 'good thing' as it leads to a more stable portfolio. However, when the price rises significantly, you must consider what is more important to you: capital gain or increased income. In the case of a DIY Income Investor, the answer is pretty clear: income! In this case my holdings of GSK (GlaxoSmithKline) and VOD (Vodafone) had increased by around 30% and the 'dividend years earned' were both over 5 years. In my mind, I have therefore already earned 5 years' worth of income from these shares. Moreover, given the current turmoil in the markets, there are a lot of opportunities for investing for income with the proceeds at the moment - hopefully boosting my overall income. The downside of this transaction is that both of these are good solid HYP (high yield portfolio) shares but I may have the opportunity to buy back in if the price falls in future. In the case of GSK I still hold another parcel of shares that has not yet performed so well. Are you taking compounding (DRIP) into consideration? I don't DRIP (i.e. take additional shares instead of cash dividend). Instead I use all the income within a tax-protected account to diversify when possible into new securities. I'm having a similar dilemma. If only you have kept these, today worth a lot more... !